1. Netflix and sell: The streaming giant is signing up new users, but not quickly enough to keep investors happy. Shares in Netflix (NFLX) were poised to drop sharply Tuesday after the firm said it added 5.2 million subscribers last quarter, about 1 million fewer than expected. On a conference call Monday, CEO Reed Hastings noted that the company has missed on subscribers before. He attributed such snags to a "lumpiness in the business." The company said it had made $384 million in profit in the second quarter on $3.9 billion in sales. Netflix closed at $400 per share on Monday. Last week, Instinet analyst Mark Kelley set a price target of $370, saying he was was worried about an increasingly competitive landscape. 2. Prime time for Amazon: Amazon's (AMZN) self-created Prime Day holiday is off to a rocky start. The retailing giant's website experienced periodic outages on desktop and mobile on Monday, right after the Prime Day sale began at 3:00 p.m. ET. Many shoppers hoping to score deals were instead met with photos of cute dogs, the company's standard error page. Shares in Amazon were poised to dip at the open. 3. Big Tech faces Congress: The US House Judiciary Committee will question Facebook (FB), Google (GOOG) and Twitter (TWTR) on Tuesday about how they filter content. It's unclear whether the hearing will produce fireworks. When Facebook (FB) CEO Mark Zuckerberg testified before Congress following the Cambridge Analytica data breach, shares of the company soared. 4. A new deal for Europe and Japan: The European Union and Japan have put the final touches on a deal that slashes tariffs and removes other trade barriers. They have also agreed to recognize each other's data protection systems as "equivalent." "Data is the fuel of [the] global economy and this agreement will allow for data to travel safely between us to the benefit of both our citizens and our economies," said EU commissioner Věra Jourová. 5. Global market overview: US stock futures were little changed. European markets were mostly higher in early trading. Asian markets ended mixed. 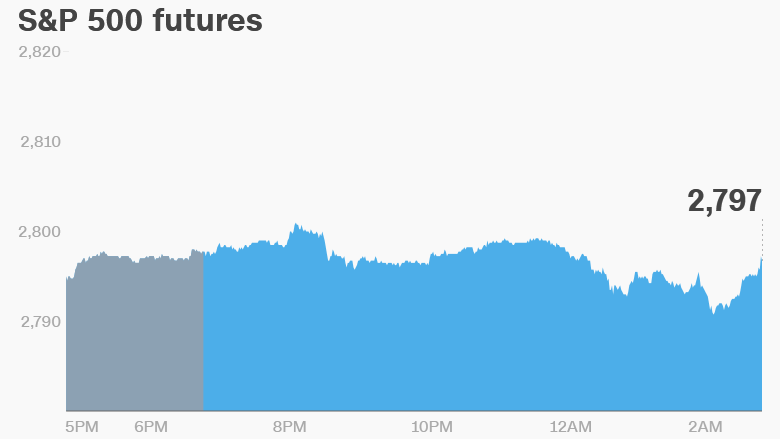 US oil prices posted a small gain after plunging 4% on Monday. The Dow Jones industrial average added 0.2% on Monday, while the S&P 500 dropped 0.1% and the Nasdaq declined 0.3%. 6. Earnings: Charles Schwab (SCHW), Goldman Sachs (GS), Johnson & Johnson (JNJ), Progressive (PGR) and UnitedHealth (UNH) will release earnings before the open.